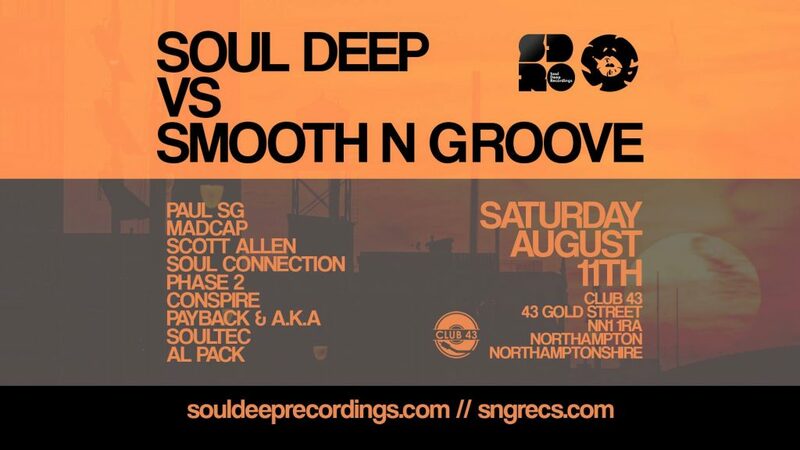 Soul Deep Recordings and Smooth N Groove are excited to announce the full lineup for the next event on August 11th in Northampton!! Tickets will be going on sale for the event, and they’ll surely sell out very quick, so watch this space for more information. The host site, Club 43, is an intimate venue, with a limited capacity, so the vibes will be thick. The last event in Northampton was a night that will never be forgotten, so you will not want to miss out! Make sure to save the date and hear what the deejays and emcees have in their arsenal. With so many great artists, with such immense talent, this will definitely be a memorable night. Don’t miss out!! Paul SG is a Vienna based Drum & Bass producer that has been rocking the scene for years with his signature sound. From an early age, Paul has been musically inclined, with his favorite genre being Jazz. His love for Jazz music comes through in every track that he produces, and his sets often flow with the same smokey Jazz Lounge vibes. Paul has been a resident at the infamous Fabric Nightclub in London for LTJ Bukem’s night. His productions have been released on many of the finest labels Including Soul Deep, Shogun, Liquid V, Fokuz, Good Looking, and his own label, Jazzsticks. Jazzsticks Recordings is one of the leading labels when it comes to releasing Jazz infused dance floor classics. Paul’s performance in Northampton will surely be one that you will not want to miss!! Madcap‘s involvement in the scene has lasted for well over 20 years, and his musical genius is undeniable. His knowledge of the music and skills shine through in every song he produces and every set he throws down. He has a successful Radio Show, The Creative Wax Show, where his talents are on full display. On his show, Elliot flashes his ear for great music, his incredible mixing ability, and his flare for scratching records in a style all his own. Madcap is well known for dropping music on all of the most well known labels, such as Good Looking, Fokuz, Soul Deep, Smooth N Groove, Creative Wax, Mac II, Celsius, and many more. Scott Allen, an accomplished Deejay and producer, will be performing for only his second time in the U.K. Scott is the owner and operator of Soul Deep Recordings, and has become well known for his ability to release quality music, creating it’s own niche in the D&B world. He has also produced big music that has landed on such labels as Soul Deep, Smooth N Groove, Good Looking, Liquid V, and Fokuz, just to name few. Scott will bring the heat, just in time for the August event. Soul Connection has become a top producer and wicked DJ in the Drum & Bass scene. With albums on both Soul Deep and Smooth N Groove Dragan has created a distinct and top quality sound that stands out amongst scene. Additionally, he has releases on the well known Influenza Media, Sheer Velocity, Atmomatix, Director’s Cut, and Inform Records to name a few. Look forward to catching his vibe at the Soul Deep vs. Smooth N Groove Night this August! Phase 2, a London based Drum & Bass producer, is well known for making wicked tracks that are essential for any collection. His music has been released on some of the most popular labels out there, including Soul Deep, Focus, Intrigue, Liquid V, Jazzsticks, and many more. His music has been supported by many of the biggest name in the D&B scene, including LTJ Bukem, Fabio, Bailey, Bryan Gee, Random Movement, Dave Owen, Nu:Tone, Scott Allen and many more. If you like the funky, jazzy, energetic sound, then you’re going to love Phase 2’s set. He was last spotted headlining Jazzsticks’ latest party in Vienna, and now he’s slated to rock in Northampton. Essential listening! Conspire, a Shrewsbury based deejay and producer, makes his return to the second Soul Deep vs. Smooth N Groove Night. He’s been featured on some stand out labels such as Technique, Skeleton, and Shaolin Audio. His tune with Payback “Skyline” has been a favorite in sets from top DJs in the scene including LTJ Bukem. A regular DJ at the Buttermarket’s Perception nights, Jamie has played alongside some of the best, recently including Fabio and Grooverider & Calibre. One not to miss! Jamie will definitely be bringing his best! A.K.A is an accomplished producer, who has a growing list of producers that are seeking to collaborate on musical projects. Over the years, he has continued to amass an impressive amount of works with some of the scene’s best including Blade, mSdoS, soulTec, Wyman, Payback, Greekboy, Radias, Soul Connection, and many more! The man also has impressive releases on both Soul Deep and Smooth N Groove, incorporating everything from liquid rollers to wicked Amens. Payback is a well-known name throughout this niche genre of Drum & Bass. His sound is much sought after amongst headz and his following has continued to grow steadily over the past few years. His production style is distinctive, and has seen him have various releases on labels such as Sheer Velocity, Soul Deep, and Smooth N Groove. His track, “Skyline”, a collaboration alongside Conspire, has recently been receiving huge support from scene legend, LTJ Bukem. soulTec, an Oxfordshire based producer and DJ joins this monster lineup. He is sure to bring his distinctive jazzy and soulful take on the genre. With an ever growing back catalogue soulTec has seen releases with some of the scenes most iconic labels including Good looking Records and Fokuz Recordings. His last live set was at the legendary London based club Fabric for one of the Bukem in session events. Make sure you don’t miss out on one of his very rare live sets, as he’s sure to have plenty of exclusives to drop. Al Pack, predominantly known over recent years for his countless amounts of bootlegs, remixing everything from Erykah Badu, Souls of Mischief, to Notorious B.I.G. However, he has also seen much successes with his own productions which have been released on some of the scenes biggest labels including Celsius, Think Deep, Soul Deep and Paul SG’s label Jazzsticks Recordings. His music has received ongoing support from scene heavyweights Bryan G, Random Movement, Dave Owen and Makoto. Al Pack is no stranger to live performances. His smooth skills and infectious energy behind the decks has led to numerous residencies with slots alongside LTJ Bukem, Nu:Tone and Logistics. MC PM, Five Alive, and Redeye, are all accomplished emcees in their own right. Each lyricist brings their own flow and flavor to the mix, which will ensure that the vibes are tight at the show. We are blessed to have them perform! !